It’s all a bit retro-tastic here these days! 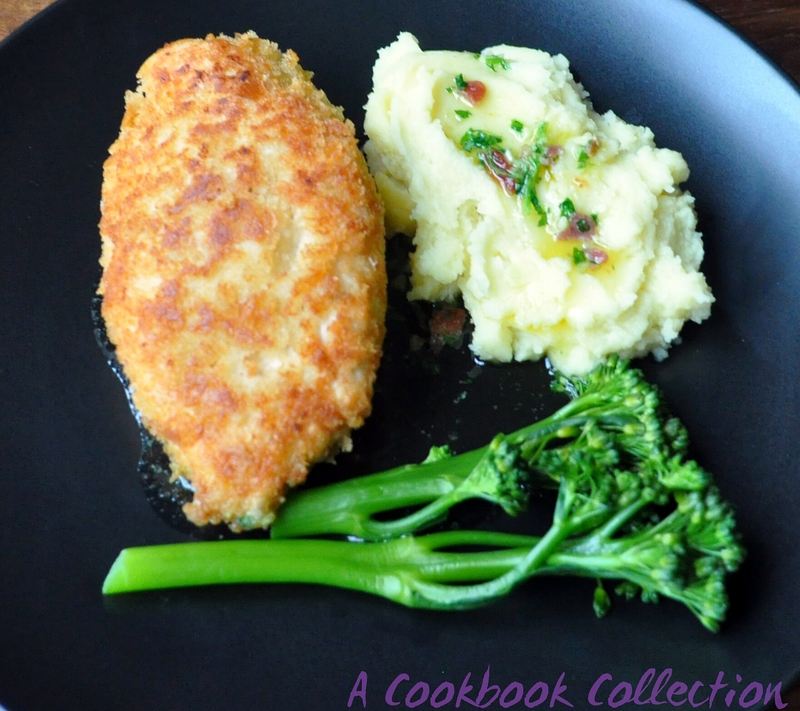 I hadn’t had chicken kiev for years as the ready made frozen meal experiences I had in the past were not the most pleasant. Then I spotted that it features in Tom Kerridge’s Best Ever Dishes and Jamie Oliver’s Comfort. I believe there’s also a version in Gizzi Erskine’s new book but as I’m on a self imposed spending ban I’ll have to wait to check out her recipe! I decided it must be worth revisiting and trying a homemade version. I wasn’t disappointed. It really is very tasty, a lot easier than you might think and adaptable. For example, I have crumbled bacon into the garlic butter because I’m firmly in the ‘bacon makes everything better’ camp. It’s not traditional but it is bloody good! You can leave it out or do as Jamie does and stuff full pieces of bacon into the chicken. You could also use bacon salt instead if you have some handy. The recipe makes more garlic butter than you will need but you can slice and freeze the leftover butter to use later. It would be great on steak and I use it to spread on toast to make a simple garlic bread. Jamie’s recipe states that you can skip frying the chicken and cook it fully in the oven. Honestly, it’s stuffed with butter. Don’t sacrifice the crunchy fried coating just to fool yourself into thinking that you’re having a healthy option! Start by making your garlic butter. It needs a little time to set in the fridge. You can make it well beforehand if you want to get ahead. Cook your bacon if using it, either in a frying pan or by grilling. Cook until it is a little bit over and very crispy. Drain on kitchen paper and allow to cool completely. Put the butter into a large bowl. Peel and crush the garlic and add this with the parsley and cayenne pepper to the butter. If you are not using bacon add some salt at this stage to season. If you are using bacon that will be salty enough. Mix thoroughly until fully combined. Crumble the cool bacon into small pieces. Add this to the butter and mix well together. Using a spatula, pile the butter mixture onto some clingfilm or parchment paper. Mould it roughly into the shape of a really thick sausage. 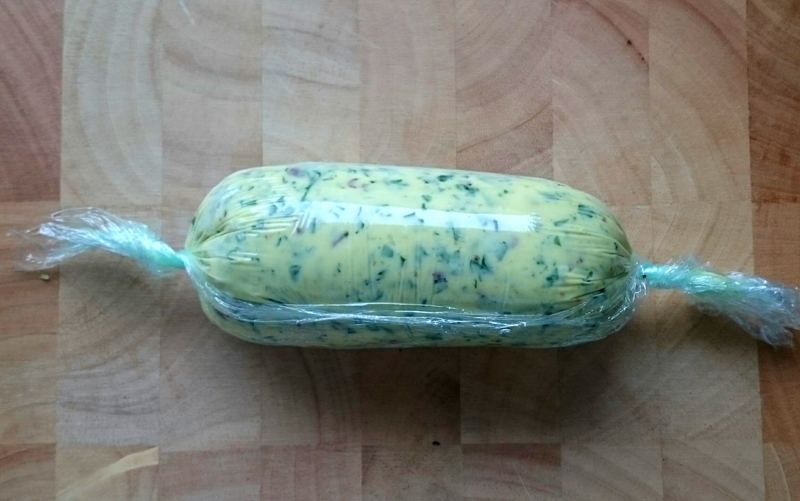 Cover with the clingfilm or paper and roll it back and forth until it forms a little parcel (see below). Put the butter parcel into the fridge to set. When you are ready to make the dish, preheat the oven to 180c/160c fan/gas mark 4. Get three bowls and put flour in one, the beaten egg in the next and the breadcrumbs in the third. Season the breadcrumbs lightly with salt and pepper. To stuff the butter into the chicken breasts, pull back the mini fillet on the breast and use a very sharp knife to cut a pocket in the main breast. Be very careful not to cut through the flesh completely or the butter will simply disappear into the pan when cooking. Next roll the chicken breast in the flour, shake off any excess and dip into the egg. Next dip it into the breadcrumbs and press the crumbs into the chicken to make sure it is fully coated. 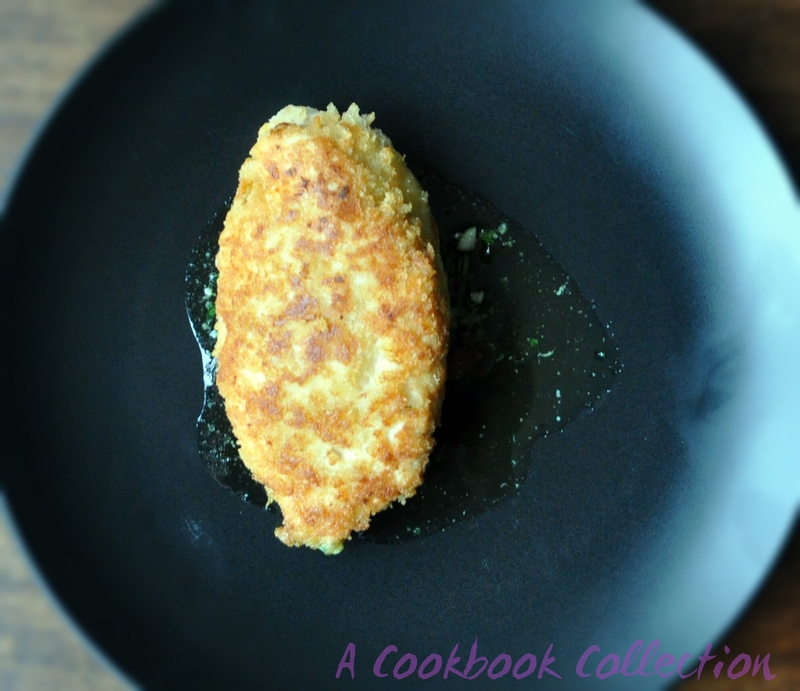 I like to go back to the egg and then breadcrumb again to add a extra coating, you don’t have to do this. Heat about 2cm of the oil in a pan over a medium high heat. Fry the chicken on both sides for about 3 minutes until the breadcrumbs have turned a nice golden brown colour. Transfer the chicken to a baking tray or casserole dish and bake it in the oven for 10-12 minutes until the chicken is cooked through. If you are going for full on comfort like I was, serve with mash and some greens (this is how I fool myself that I’m healthy!) You could go for a lighter option and serve with a green salad and some bread or boiled new potatoes. Looks sooo good! I made the Jamie’s Comfort food one many moons ago, so worth the effort. Not perfect? I’ll have it then so, if you want another bash at it. That is just gorgeous. 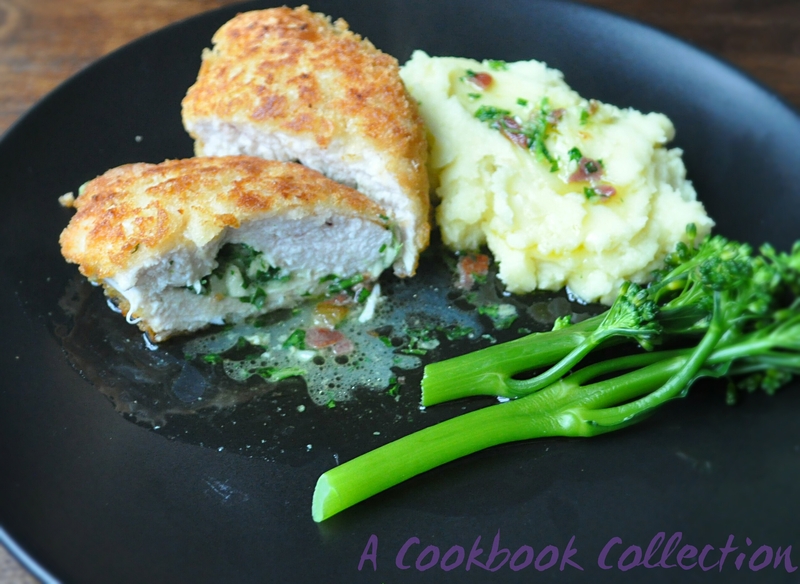 I’ve always had problems with stuffing chicken breasts, but your looks perfect!!! A lovely meal. I just got your comment so had to come and have a look, yours look amazing! Your filling sounds great and am liking the idea of bacon salt!! Thanks Jacqui, you’re very kind!